A friendly, accommodating team awaits you in the warm, pleasant environment at Wild Chiropractic. We’re ready to welcome you and enjoy keeping a lighthearted atmosphere at our practice but are serious about improving your health and lifestyle. Your initial appointment takes about 45 minutes if you fill out the necessary paperwork ahead of time, which can be downloaded from our website. You’ll be greeted when you arrive, then brought to Dr. Wild’s office for a consultation. You’ll discuss your condition and how it’s affecting your life. Next, we’ll go to the X-ray room to take your vitals and do an examination. Digital X-rays can be taken if needed. Once reviewed, we’ll determine if we can proceed with treatment. If so, we’ll give you your first chiropractic adjustment. If another look is required, we may send these images to the radiologist before adjusting you. In our office the primary adjusting technique is Prone Specific. Dr. Wild may also do some electrical acupuncture and intersegmental traction or roller table. When completed, you can go to the front desk to check out and make your next appointment. When you return, we’ll discuss a full report of our findings with you. We’ll show you your X-rays so that you can see where the problem is, talking about which type of care that is right for you. From there, we can create a treatment plan that works for you. We’ll give you another adjustment and any needed therapies, and you’ll be on your way in about 20 minutes. At your next appointments, we’ll see you promptly to keep each visit efficient and effective for you. You’ll see Dr. Wild, get the necessary treatment and check out at the front desk. It may take time to regain your health, as it’s likely you’ve had this issue for a long period. 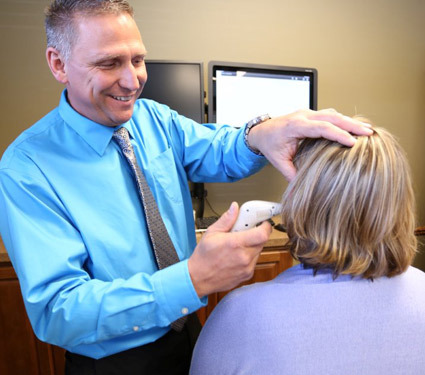 Once we’ve relieved your discomfort or corrected the source of your problem, you can decide if you would like to see us on a regular basis for wellness care. The choice is yours. We offer late appointment hours for your convenience. Schedule your appointment today! Dr. Wild is an in-network provider for many insurance plans.